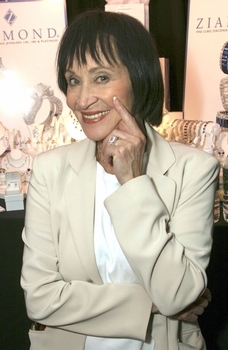 Chita Rivera visited us at Ziamond and posed with her own Ziamond Cubic Zirconia CZ Ring with a pink colored center stone. Ziamond Cubic Zirconia CZ Jewelers offers pink, canary, ruby, emerald, sapphire and diamond look stones in any of our designs. All Ziamond Cubic Zirconia CZ Jewelry is set in 14k gold, 18k gold or platinum.